Compact tractors should not be confused with their bigger brethren. 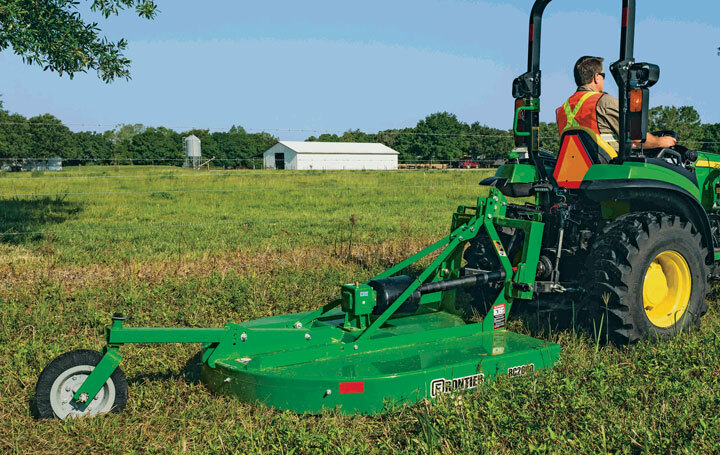 Compact tractors — limited in this case to models with less than 40 PTO hp — are full-fledged workhorses utilizing a variety of implements or attachments. “When you own a big combine or sprayer, you go out and combine or spray,” says John Deere’s Jared Lowe, product marketing manager for compact tractors. “But when you own a tractor, you don’t go out and tractor. You have to have something on it.” That something might be a snow blower or a backhoe or a mid-mount mower. Whatever the implement, the tractor’s hydraulic and power take-off systems are the engineering components that let the tractor blow or mow or backhoe. The power take-off (PTO) system goes back 100 years, with International Harvester introducing it to the tractor market. It features a splined output shaft to which can be attached drive shafts to power implements. A “live” PTO transfers the power directly from the engine to the implement regardless of whether a tractor is moving or at rest. Hydraulic systems go back even further. They utilize the principle of fluid mechanics discovered in the 17th century, which explained how fluids pressured at one end of a confined space produce force at the other. Fittingly, it was a compact tractor inventor — Harry Ferguson — who first employed the technology in his three-point hitch attachment system. The industry eventually adopted a universal standard for the hitch system. The hitch has a fixed pivot connection at the upper rear of a tractor. Enclosed hydraulic pistons lift or lower two arms that extend out from the lower rear of a tractor. The three attachment points create a stable platform for whatever implement is riding it. In recent decades, engineers have adapted the hydraulic fluid application to power steering, hydraulic motors and hydrostatic transmissions. Compact tractors are a major beneficiary of the revolutionary technology. While a hydrostatic transmission robs some usable horsepower, perhaps one or two horsepower in a 40-hp machine, the loss is negligible. As a result of the trade-off, an operator has infinite hydraulic shifting capability, which makes driving one of these tractors a pleasure. Suburban property owners, who crawl on tractors on weekends, much prefer hydrostatic transmissions to mechanical shifting. The traditional place to find a PTO shaft is at the rear where it powers rotary mowers, tillers and similar implements. However, most compact tractors also offer a midpoint PTO connection, used almost exclusively for belly mowers. Many compact models offer both power take-off connections, usually as an option at midpoint. Why just usually? “In standard models, it is a price point factor,” says Robert Cockroft, Kubota’s product manager for tractors under 100 hp. “If a buyer is only going to be running a rear box cutter, he doesn’t need the expense of a midpoint connection. 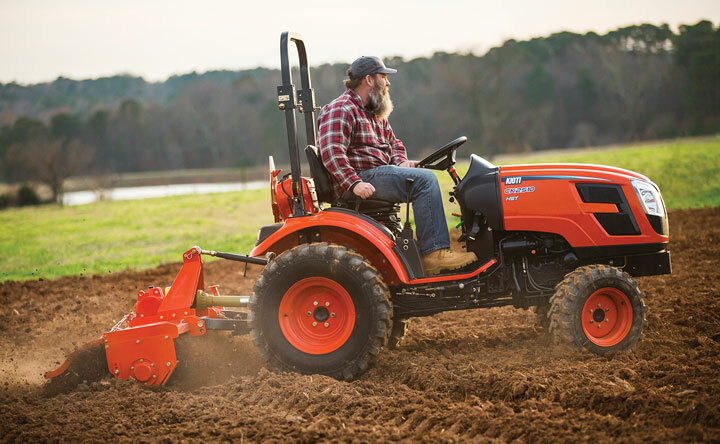 Where the midpoint PTO comes into its own is running mid-mount mowers, as in our B Series tractors.” The B Series offers both PTO outlets, as do some models in Kioti’s CK10 Series tractors and Yanmar’s YT Series. According to Reid Hamre, ag product marketing manager for Yanmar America, the company’s customer base is the “lifestyle person” in the Northeast United States. 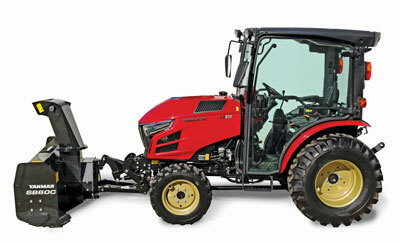 Those customers and others in the region want a tractor like the YT235C with a front-end loader. “Loaders and tractors are married to each other,” Hamre notes, meaning one seldom is bought without the other, an industry-wide pattern. The 235C is popular because it is fitted with a climate-controlled cab so that, when winter blows in, operators can load and dump snow, or remove the loader and clear driveways with a front-mounted snow blower or rotary broom. A rear PTO runs at 540 rpm, more or less the standard across the industry, with the midpoint PTO geared to run at 2,000 rpm. “It’s a fairly significant difference,” says Tim Phillips, territory manager for Kioti Tractor. “Mid-mount mowers run at a higher rpm than do rear rotary mowers. The mid-mount needs the additional rpm to create suction and lift up grass before cutting it.” Belly mowers manicure lawns, in other words, whereas rear-mounted rotary mowers are primarily a tool for knocking down overgrown vegetation. Deere has just released a new lift system for mid-mount mowers on its compact models 2032R and 2038R. The mower is independently lifted and lowered electrically. Because the same hydraulic lift pistons usually raise and lower rear and mid attachments, the electrical lift system allows an operator to control mower height without affecting a rear-mounted attachment. Bottom line: Compact tractors must have attachments (or implements; the terms are interchangeable, depending upon who is speaking). For this reason, Kioti partnered with Woods Equipment in December to offer a wider range of attachments. Earlier in 2016, Kubota purchased a Kansas firm, Great Plains Mfg., to the same end; the Land Pride division of the Kansas company manufactures numerous implements including tillers, drills and mowers. Besides loaders, other popular compact tractor attachments include a backhoe — though mini excavators have eroded the market — as well as mid-mount mowers, rotary mowers and box blades. Up north, snow blowers are a fixture. Less frequently employed are ground-engaging attachments like disc harrows. “And I’ve seen some pretty wild attachments from Italy for taking care of grapes,” Lowe says. A rear PTO runs at 540 rpm, more or less the standard across the industry, with the midpoint power take-off geared to run at 2,000 rpm. The Kioti territory manager adds that “the main consideration to fitting an implement to a tractor is always going to be horsepower. But in respect to operator satisfaction, weight is the critical factor. There is a distinct difference between a tractor having enough horsepower and being able to make use of the horsepower.” Correctly coupled engine size and tractor weight lets a tractor dig in its wheels so an implement can go to work.